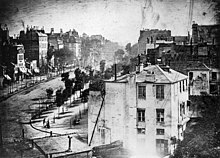 Early experiments required hours of exposure in the camera to produce visible results. 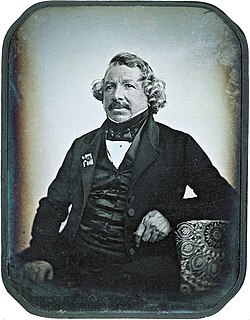 Modern photo-historians consider the stories of Daguerre discovering mercury development by accident because of a bowl of mercury left in a cupboard, or, alternatively, a broken thermometer, to be spurious. 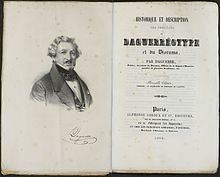 Much of Daguerre's early work was destroyed when his home and studio caught fire on 8 March 1839, while the painter Samuel Morse was visiting from the US. 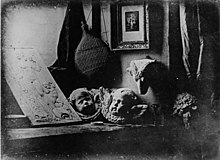 Malcolm Daniel points out that "fewer than twenty-five securely attributed photographs by Daguerre survive—a mere handful of still lifes, Parisian views, and portraits from the dawn of photography." 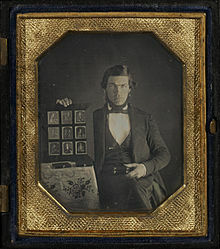 Daguerreotype photography spread rapidly across the United States after the discovery first appeared in US newspapers in February 1839. 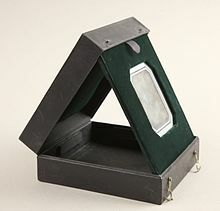 In the early 1840s, the invention was introduced in a period of months to practitioners in the United States by Samuel Morse, inventor of the telegraph code. ^ Heathcote, Pauline F. (1991). Coope, Rosalys; Corbett, Jane, eds. Bromley House, 1752–1991: Four Essays Celebrating the 175th Anniversary of the Nottingham Subscription Library. Nottingham Subscription Library. 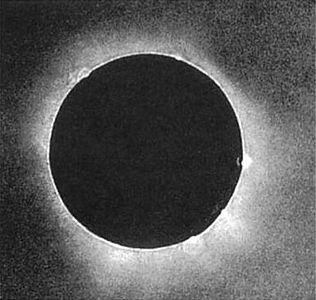 p. 102. ISBN 0-9517499-0-0.